Timber furniture has a certain character and ambiance that is difficult, if not impossible, to replicate with synthetic materials. Today, though, we have a concern that we will diminish our supply of trees throughout the world to reap sufficient amounts of timber not only for furniture, but also for fuel, mulch and other uses. For this reason, furniture makers should only work with FSC sustainable timber to create their pieces. FSC is an organisation that helps care for the forests throughout Australia and other parts of the world in order to prolong their renewable ability for the sake of trees, plant life and animals within them, and so the forests keep benefiting the local communities and indigenous people who may depend on the forests for their needs. When a timber has the FSC certification, you know immediately that it comes from a sustainable source. Sustainable means that when workers harvest trees, they replant them. Also, they perform their jobs in such a way as to not harm the natural environment of the sustainable forests. When furniture makers use FSC sustainable timber in the creation of their pieces, it shows that they care about the environment. Buying their products also helps you protect the old-growth forests throughout Australia to preserve them for future generations. Since this type of timber comes from forests that receive special care, the timber is in top-quality condition and receptive to sanding, staining and painting. As a result, the furniture that includes it is not only attractive, but also it is highly durable. Contact Wenborn Wood for further facts about why FSC sustainable timber should be used in furniture making. 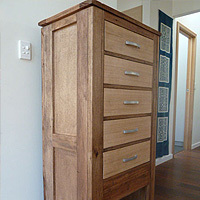 We offer tables, adult beds, cabinets and other items that we create from this type of timber along with recycled Australian timbers from various local sources. Our company also believes in using only traditional joinery methods without staples, nails or screws except with handles and hinges. Browse through our website to learn additional facts about our company and furniture. Wenborn guarantees quality craftsmanship and materials with each piece that you purchase from us.